The Carvivores, a three-woman team, carved one day in wind chill that made the temperature seem like 55 below zero in Lake Geneva, Wisconsin. A three-woman team from central Maine won second place Saturday in the U.S. National Snow Sculpting Competition on Lake Geneva, Wisconsin, after sculpting in temperature that reached 55 degrees below zero with the wind chill factored in. Carvivore team member Amanda Bolduc works on “Prevailing Wings,” the Maine team’s entry at the U.S. National Snow Sculpting Competition in Lake Geneva, Wis.
Serena Sanborn, of Winslow, Cathy Thompson, of Madison, and Thompson’s daughter, team captain Amanda Bolduc, of Skowhegan, were thrilled with their win, they said, and proud to have represented Maine in the competition, which included 15 teams and a total of 45 sculptors from all over the country. “We were dumbfounded and awestruck,” Thompson, 66, said early Sunday of their win. The Maine team, The Carvivores, sculpted “Prevailing Wings” from a 9-by-8-foot cylinder of snow that had been prepared and packed for them ahead of time. They worked over four days, from Wednesday through Saturday, including overnight Friday, to complete the sculpture of an archangel overpowering a demon — representing good versus evil. A Minnesota team won first place for a blue heron sculpture and a Vermont team came in third, with a sculpture of three triangles intertwined in an intricate geometric configuration. Bolduc also won a special award for good sportsmanship and embodying kindness. On Sunday morning the Maine team members were at their hotel in Lake Geneva, about to have breakfast before driving to the airport to head back home. Sanborn and Thompson both had contracted colds Tuesday on the flight to Wisconsin yet worked on the sculpture in frigid temperature and a brutal wind, they said in a telephone interview. 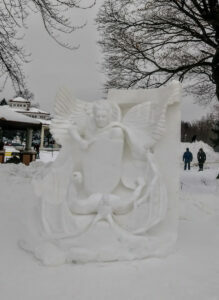 “Prevailing Wings,” the creation of Maine’s team, The Carvivores, won second place Saturday at the U.S. National Snow Sculpting Competition in Lake Geneva, Wis.
Bolduc had flown to Wisconsin from Florida, where it had been 80 degrees; and while the temperature change was hard, she adapted. Thousands of people turned out to watch the sculptors at work. Sanborn, 44, a Canaan native, said she had never experienced such cold. The team members shipped their tools to Lake Geneva ahead of time, as they are not allowed on the plane. They included pruning saws, wallpaper scrapers, horse curry combs, wallboard knives, wood chisels, gardening tools, ice chippers, floor shavers and rough sandpaper. Power tools are prohibited. The first day, they set up scaffolding at their snow block and cut away at the block to prepare for carving and then detailing and sanding. On Saturday, they stopped sculpting and a Wisconsin legislator announced the winners, who were chosen by the teams themselves. Bolduc said she and Thompson and Sanborn are surprised and humbled at having won second place. The women got a nice surprise when Sarah Sugden, former Waterville Public Library director, visited the competition. Sugden moved to Green Bay, Wisconsin, last year to take a job at the Brown County Library System there and drove about two and a half hours to Lake Geneva to see the Maine team. Thompson, who home-schools her three children and is an Army National Guard veteran; Bolduc, a retired chemical purchasing agent for Sappi; and former team member Paul Warren, of Massachusetts, won fifth place at the national competition in 2016. In 2017, they won third place, as well as the People’s Choice award. In 2015, they were champions at Camden’s Winterfest snow sculpting contest. Bolduc and Thompson have competed in sand sculpting contests in Florida for about 13 years. 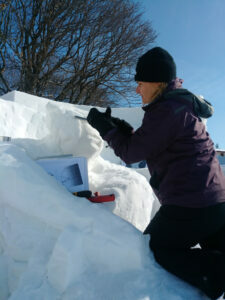 Sanborn, who is programming and outreach coordinator for Waterville Creates!, competes in snow sculpting contests in Jackson, New Hampshire.